When it comes to the your online reputation management, typing “Enter” is like pulling the trigger of a gun. You can’t get the bullet back, nor can you undo something on the Internet once it’s been seen or sent. In the information age, a company’s reputation faces an even greater threat from within than from without. In addition to wily competitors and customer grievances, a gaffe on the Internet can grow beyond your control in nanoseconds. The best way to avoid such an “epic fail,” here are the most damaging online threats to your reputation. The only thing between you or your company’s reputation and the keyboard is your brain. Alcohol, even in small amounts, can disable the mental filters you normally use before you post on Facebook or Tweet. You don’t want to wake up with both a hangover and the realization of how much your posts were shared by so-called friends on Facebook. Never say anything bad about your customers or clients online. The main purpose of your presence on the Internet is attracting more business. In the eyes of clients, if you badmouth one, you could badmouth others. Nobody want to be disrespected, and no matter how great your product or service may be, there are other places to get it. Don’t drive your business away. In fact, avoid trashing anyone online. This applies to the competition, your colleagues, or even someone who may be badmouthing you. Sure, it may feel good in the moment to defend yourself. But you want to cultivate a reputation of being friendly and someone that customers aren’t afraid to talk to. Once you get mean online, there’s permanent proof out there of your dark side. It feels easier to lie online because there’s a screen in front of you and not a face. You may be exaggerating or embellishing without knowing it. It’s better for your reputation to be honest when you put anything online. Remember that fact checking what you post is as easy as a search on Google. Assume that someone will do it. Hollywood celebrities aren’t the only ones who face photo scandals. All it takes is a single embarrassing video or picture of you online to destroy your reputation. When cameras are around, you can be your own best friend or worst enemy. Watch your behavior, and watch your drinking, or watch yourself on the next viral video. Customer complaints online should be responded to as quickly and thoughtfully as possible. People online can not only see how you reply, they can see how long it takes for you to respond. Be attentive to your website comments section and treat online complaints as another opportunity to showcase your customer service. Take care of your complaining client and impress other potential customers that are looking on. Even if the complaint is wrong and you are right, be friendly. When you take a complaint personally and respond defensively, it looks bad. Others following the posts may believe that a defensive reaction means there might just be some truth in the complaint. Don’t let it seem like someone has struck a nerve. Respond politely and professionally. If you want to build momentum online, be present and be consistent. If you neglect your online presence for days or weeks, you lose momentum and online followers. Develop a routine which allows you to regularly update your web presence, interact with followers, and monitor your reputation. Keep track of our online presence regularly, and not merely when there’s a problem to deal with. 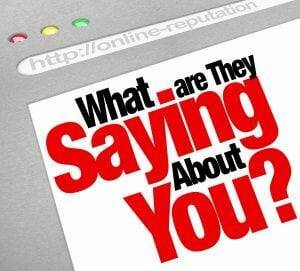 If you can, use alerts which let you know when people online are commenting about you. Whether it is positive comments or complaints, respond to them quickly. Your staff is an extension of you. How employees or even contractors act online can reflect upon your company’s reputation. Communicate to your staff how serious your online reputation is to your company’s success. Write a policy so that you and your staff are literally on the same page when it comes to your company’s online reputation management.